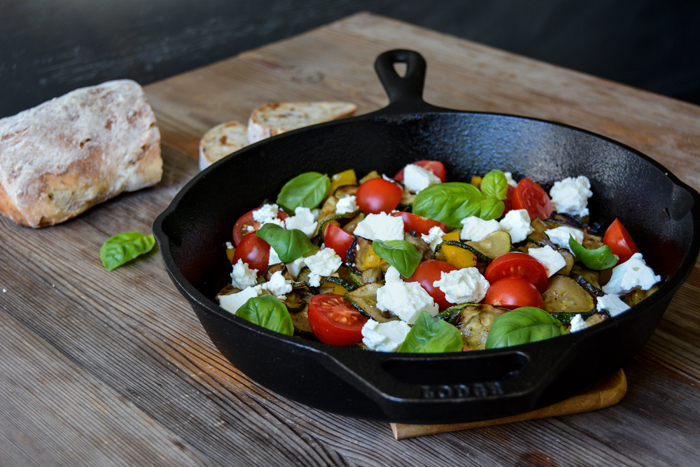 The secret behind this scrumptious Mediterranean pan lies in the separate cooking of the vegetables. 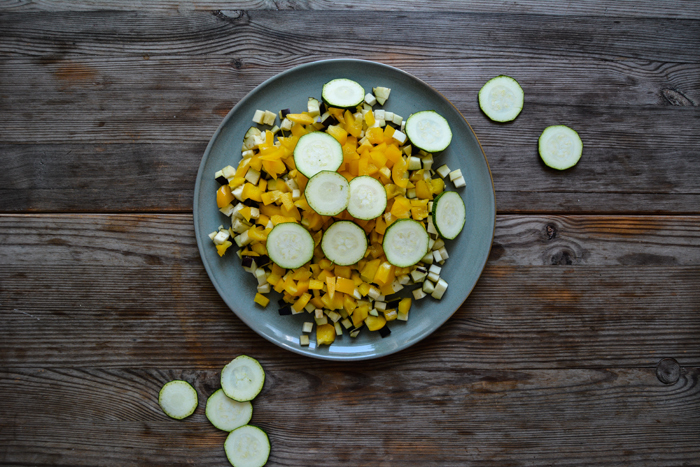 First, I sautéed sliced zucchini until golden but with bite, and then I cooked a large handful of aubergine and bell pepper chopped into tiny cubes. The small size let them release a little more of their juices in the hot pan, within minutes they turn into a chunky stew. Mixed with the zucchini, it just needed a bit of salt and pepper and it was done. You could easily leave it at that but I was after a colourful pan full of fresh flavours. 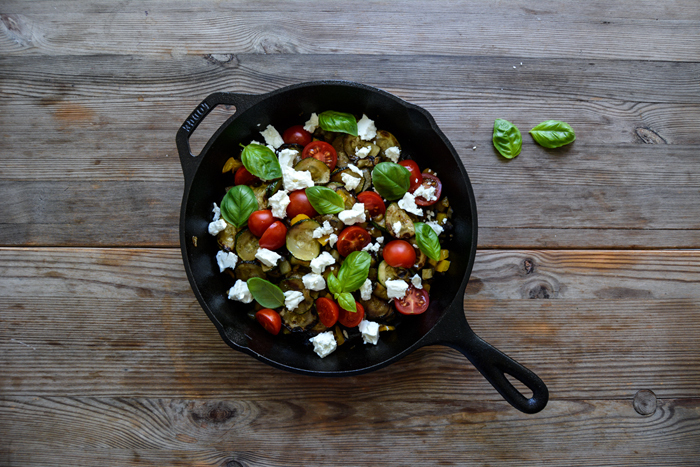 In summer, I like the combination of cooked and raw vegetables, so my pan got a crunchy topping with cherry tomatoes, milky feta chunks and fresh basil leaves. 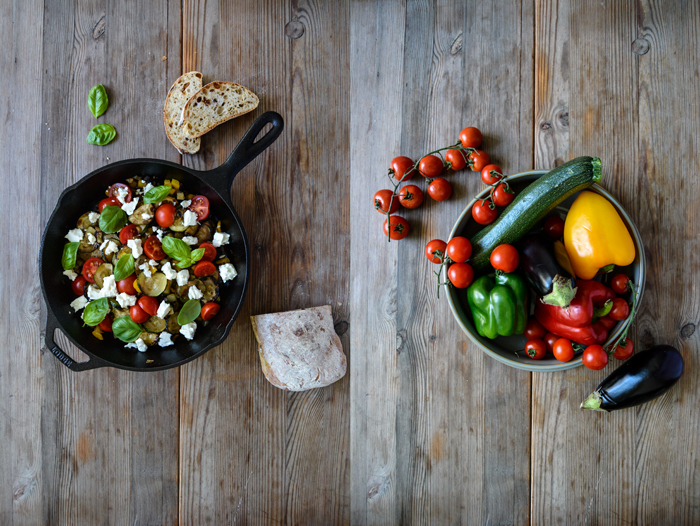 All the wonderful aromas of a Mediterranean garden on a plate! There are a million variations of this dish, you could top it with lemon ricotta (instead of the feta cheese) and make a moussaka, mix in some spaghetti for a richer meal or cook all the ingredients in the oven, like my vegetable casserole. So many options, so many warm months and ripe and tasty vegetables ahead of us. Kitchen life is just great at this time of year! Heat a slash of olive oil in a large pan and sauté the zucchini on medium-high heat until golden brown with a little bite. Season with salt and pepper to taste, transfer to a plate and set a side. Put the pan back on the heat, pour in a splash of olive oil, stir in the garlic and let it turn golden (not brown!) for about 1 minute. Add the aubergine and bell pepper, season with salt and pepper and sauté until golden and soft. 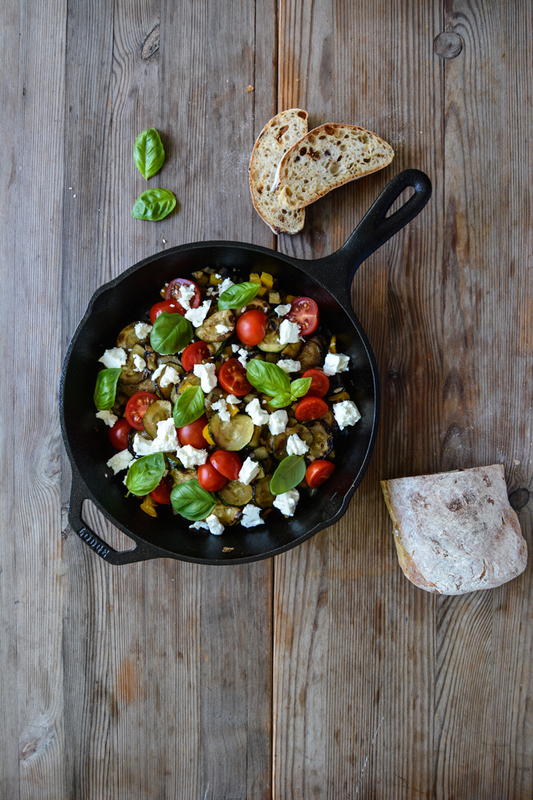 Take the pan off the heat, mix in the zucchini and tomatoes and season to taste. 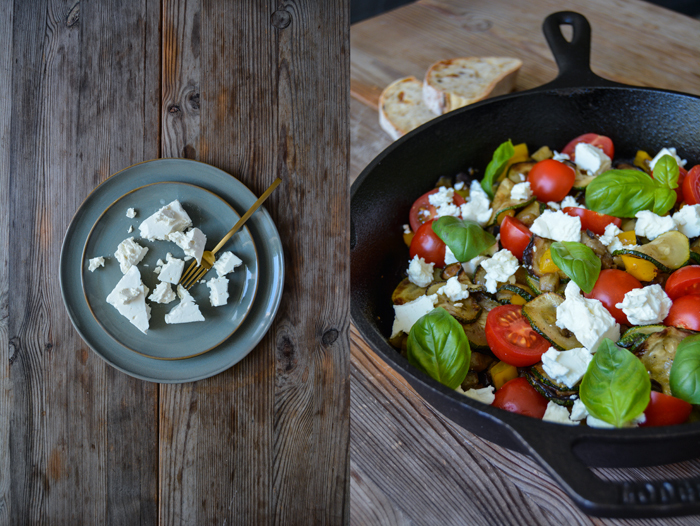 Stir in the feta and basil and serve immediately, or as a warm salad, with fresh ciabatta bread. This dish was fantastic! I paired it with lemon roasted potatoes, and it was sooo good!!! Thanks for the recipe! The difference was that I used a Le Creuset soup style dish, and didn’t have zucchini, but it still turned out great! 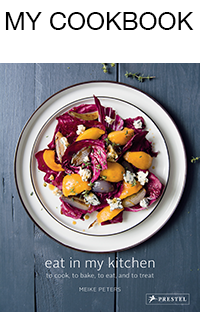 Oh, this sounds so good, Connie, you make me feel like summer! I’m glad you enjoyed it. Have a wonderful Sunday!